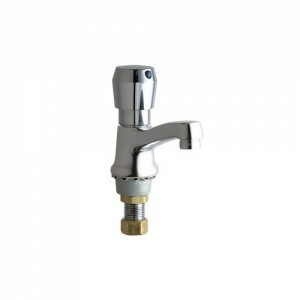 Chicago Faucets 333-665PSHABCP ECAST Low Lead Single-Handle Metering Bathroom Faucet is a deck mounted, single hole, lavatory metering faucet. ECAST products are intended for installation where state laws and localcodes mandate lead content levels or in any location where lead content is a concern. The Chicago Faucet is polished chrome plated and constructed of a solid brass body and spout. The Chicago Faucets Lavatory metering faucet has less than 0.25 % lead content by weighted average. This product contains color-coded index buttons and meets ADA requirements while meeting industry standards. For over 100 years, Chicago Faucets has been America’s leading manufacturer of commercial faucets, offering a complete range of products for schools, laboratories, hospitals, office buildings, food service, airports and sports facilities. You can be rest assured that the products you purchase are uniquely American and quality controlled because all of the manufacturing, research and development facilities are located here in the United States.